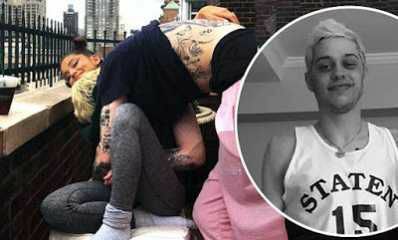 Ariana Grande's best friend Courtney Chipolone took a loved-up snap of the four-time Grammy nominee cuddling her fiancé Pete Davidson on the balcony of their $16M, five-bedroom Chelsea apartment on Sunday. The 25-year-old R&B songstress has been maintaining a low profile since the September 7 fatal overdose of her ex-boyfriend Mac Miller, so she and her 24-year-old Staten Island beau opted to watch the 2008 Pixar animated feature WALL-E together. The Florida-born belter also Insta-storied a snap of herself putting her four-octave soprano pipes to good use in the recording studio. Ariana's PDA post came shortly after she finally revealed the reason there's a crib inside their lavish New York love nest. 'That's Piggy Smalls' play pen in the background. The red [lamp] is to keep [the pig] warm,' she clarified in the comments.